along with the wine’s Mediterranean origins. In the Languedoc-Roussillon in the south of France, grapevines hug the hillsides to bask in noon-day sun. 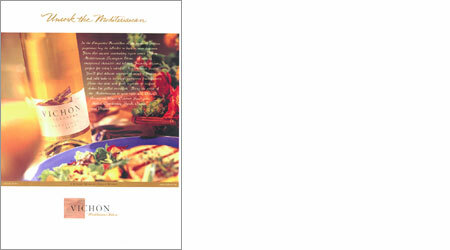 From this ancient winemaking region comes Vichon Sauvignon Blanc. A wine of exceptional character and balance. Friendly, elegant, perfect for today’s colorful Mediterranean cuisine. You’ll find delicate nuances of meadow flowers and wild herbs in its crisp, expressive fruit flavors. Serve this wine with fresh vegetable or seafood dishes like grilled swordfish. Bring the spirit of the Mediterranean to your table with Vichon’s Sauvignon Blanc, Cabernet Sauvignon, Merlot, Chardonnay, Syrah, Chasan and Viognier.